Hi, and thank you for volunteering to test Ars Plastica. First thing to remember is that after the test to please throw away the executable because we will be updating the versions after this and running an older version may have unintended results on the existing build. So PLEASE toss this one out after this evening! We will gather in the Ars Plastica Facebook group chat at 6:30PM to establish communication. While inside Ars Plastica you can feed back via the text field at the bottom left of the Ars Plastica screen. While in Ars Plastica hit ESCAPE key which will release your cursor. 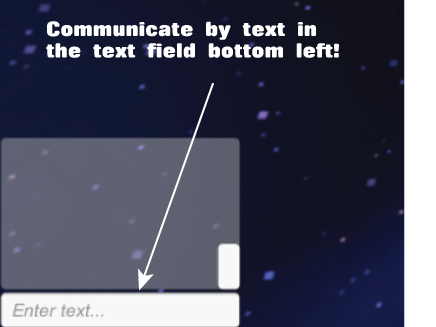 Put your cursor in the text field and type. Hit ENTER to send the text. Please also monitor Facebook Ars Plastica Group chat window if Ars Plastica crashes. The Ars Plastic Facebook group should pop up for you on the bottom right of your Facebook window. The idea is to get a comfortable amount of people logged in to the server, around 15 will do just fine. We are NOT trying to crash the server, although we might do that. If we do, please just chill in the FB chat window until we reset the server. Download the Ars Plastica executable application from the download link on this website. To limit distribution it will only be available from 5-7PM Pacific Time. Please don’t forget to make sure your computer meets the minimum specifications. Don’t try Ars Plastica if you aren’t sure. When you are done with Ars Plastica, please toss it in your trash and wait for the world release on July 5th. Download the production release of Ars Plastica version on this website by choosing any of the download links. Ars Plastica intends you to fly through the space. While there are small areas you can land on and walk around, most of your exploration will be done flying! 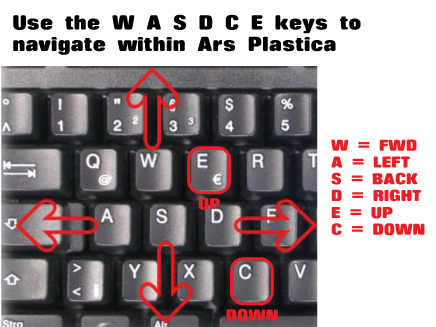 Navigate Ars Plastica using your keyboard W A S D E and C keys. W = Forward, A = Left, S = Back, D = Right, E = Up (fly!) and C = Down (and land). This should be a familiar setup to those familiar with games and virtual worlds. Remember to hit escape to release the cursor so you can type in the chat field!